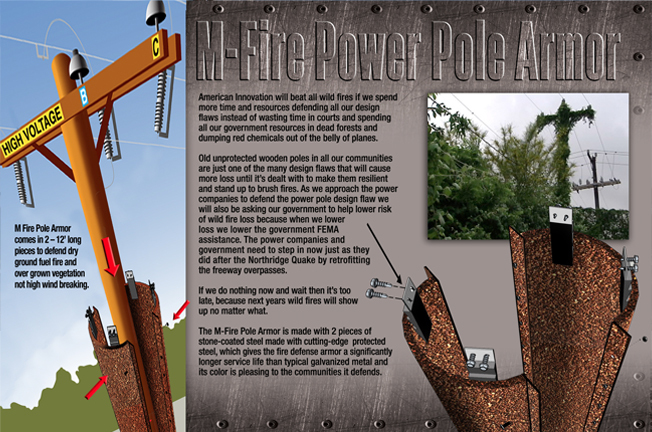 M-Fire, A California Company, Has A Cost-Effective Solution To Fire Defend The unprotected utility Poles from fire In So Many California Wild Fire Vulnerable Communities. The esthetically pleasing and effective Fire Defensive Pole Armor Samples Are In Production Now For PG&E. Big corporations forced into bankruptcy by liability lawsuits often take the offending product off the market and try to move on. That’s what happened with the Dalkon Shield birth control device, asbestos and silicone breast implants. But when the nation’s biggest utility, Pacific Gas & Electric, comes out of bankruptcy, it will face the same danger that put it in financial peril in the first place: wildfires. As the case makes its way through the courts, the industry and the public will be watching closely to see what steps PG&E takes to control its legal exposure to future blazes in an era in which climate change is likely to make such disasters more common. Will PG&E invest more in preventive maintenance to keep power lines from starting fires, adopting more aggressive tree-trimming and brush-clearing practices? Will it fortify its equipment better? Will it shut off the power in certain areas when the fire risk is high? The federal judge overseeing that case criticized the company’s wildfire safety record and proposed earlier this year that it remove or trim all trees that could fall onto its power lines in high winds and shut off the electricity when fire is a risk, regardless of the inconvenience to customers or loss of profit.